About 30 species of boxwoods exist for the average homeowner to purchase, the most prevalent being the American and English boxwoods. Homeowners choose boxwoods to use as hedges because they are an evergreen, easy to care for, grow full and plush, and can be pruned into most any shapes. 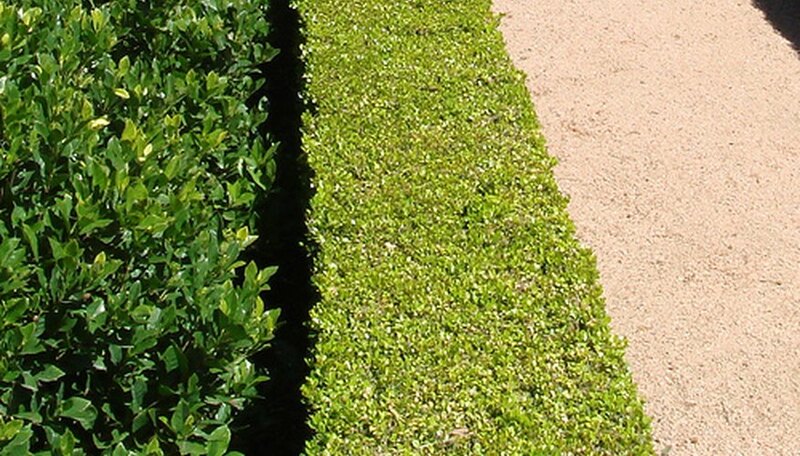 The most common shapes for hedges are boxes, rounded ovals, and spirals. No matter which kind of boxwood you have and how you plan to shape it, they all can be planted in a similar manner. Select a location to plant your boxwood hedge in either the fall or spring. Boxwoods can tolerate full sun, put prefer partial shade. Avoid areas near downspouts or under dripping trees since too much water harms boxwoods and can eventually kill them. Prepare the soil. The soil should drain well so till in a couple inches of organic matter, such as compost, peat moss or sand to your soil if necessary. At the same time, boxwoods prefer soil that has a pH level between 5.5 to 7.5. Purchase a pH test strip at your local garden store and test your soil’s acidity in several places. Depending on your results, you may need to add lime to increase the soil’s pH or add sulfur to lower the soil’s pH. Follow manufacturer directions as each brand is different, and you will need to add a specific dose based on your soil’s current acidity and the desired result. Fertilize the soil, if necessary. Take a soil sample to your County Extension Service (see Resources) to have your soil tested for nutrients. They can also test the pH levels, if desired. Testing can help you identify the kind of fertilizer your boxwoods need, if any. If you don’t want to go this extent, then either don’t fertilize or add a small amount, according to the package instructions, of urea fertilizer labeled 10-6-4. Dig your holes only as deep as the container the currently holds your boxwoods, but twice as wide. Take your boxwoods out of the containers and place them in center of the holes. Space your boxwoods based on the species. The planting instructions that came with your boxwoods should indicate how far apart to plant them. Generally, three feet apart is sufficient for most species. Backfill your soil into the hole and tamp it firmly down to remove an air pockets, which can cause root rot and kill your plants. Water well. In addition, add two to three inches of mulch along the entire hedge. Good mulches for boxwoods are pine needles, bark or wood chips.